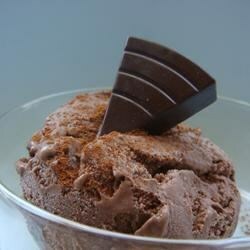 "This is a gourmet blend of smooth and creamy dark chocolate frozen custard with cinnamon. Garnish with an extra sprinkle of cinnamon and a piece of dark chocolate on top." Stir cinnamon into chilled custard batter and freeze in an ice cream machine following manufacturer's instructions. Sprinkle frozen custard with more cinnamon to serve.